Remembering My Grandfather Chok Man Chin, my Grandfather. my grandfather helping me (4 or 5 years old at the time?) 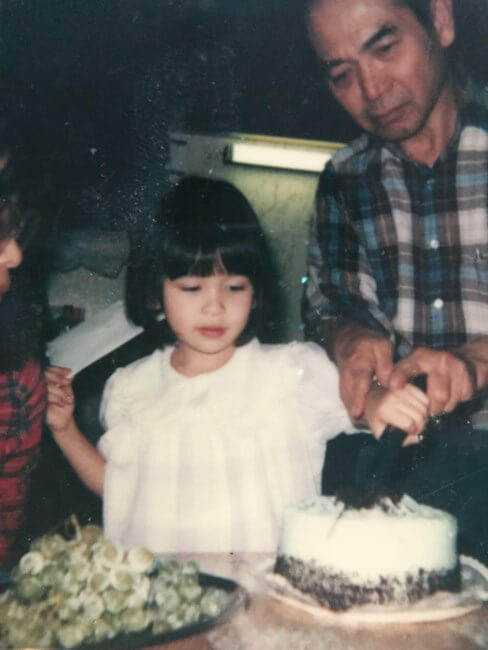 cut a cake on one of my childhood birthdays, I still remember that day. Hi Everyone, at my Grandfather’s funeral, this past Wednesday, August 29th, 2018, in Boston, MA, I was honored to give a speech to memorialize my Grandfather. He passed away at the age of 96, on Friday, August 24th. I was fortunate to have been right there in the room at my Aunt’s in Medford, MA with him, along with other family members, including my mother, aunt and cousins when he passed away and he died as peacefully and beautifully as he lived. Thinking about it still leaves me awestruck. It will take a while to heal. Going through this process has been like walking through another plane of existence. I have so many thoughts and memories about him, many of which didn’t make it in the the speech and perhaps I can add in here later, along with more pictures. I came up to visit my family and knew he was declining but honestly, did not know that he would pass away this fast and my family and I are heartbroken to lose the strong patriarch of my family. It was easy to find the words to talk about him because he put so much joy into our lives. I’m sharing that speech and some memories with all of you. I’m Sara Kellner maniez, 2nd daughter of June and Barry, June being the eldest daughter, 4th grandchild to Chok Man Chin, my Gon-gon, Chinese name for grandfather. It is a great honor to share thoughts and memories of him from my perspective as his grandchild with you today. My grandfather was a part owner and had managed restaurants over his long career in the local Chinese restaurant industry. At a family gathering, you would hear him say, “Chicken Teriyaki! Chicken Teriyaki!” Not only would he cook a multi-course banquet of food for his family but he would serve it to you and make sure that you ate it and ate seconds and thirds. “More rice? Here, eat!” Plunk, more food on your plate (and you had to finish it) After dinner everyone pitched (or should’ve) to wash and put away the dishes, sweep the floor, then gather again for coffee or tea with dessert. The worst thing was an empty stomach and he, along with my grandmother, Por-Por, took great effort to make sure everyone was fed and happy. In fact, they took such pains to make sure we ate and tried everything that you would think we were geese being prepared for fois gras. He and my grandmother cooked at any given occasion or just spontaneously, (if they weren’t cooking they were planning for the next meal, always 2 hours away from a meal)Which dish was your favorite? Was it the Bitter melon with black bean sauce? Chinese lobster? Roasted chicken? that savory meat cake with rice? Oh, my mom always talks about that one…pea pod stems with garlic sauce? (My favorite) Or was it the whole steamed sea bass. ..to name a few, world class Chinese dining at home around the family dinner table, I still remember the sound of his favorite cleaver coming down on some poor (and delicious) roasted duck at his butcher block..personally, I was most impressed with his “lazy man noodles” where he took ramen noodles and whatever was in the refrigerator at the time and made a bowl of “soup perfection”, I see that he was a resourceful, creative person who knew how to make amazing things with exactly what he had. …Perhaps my most favorite shared meal was the one where we didn’t eat food at all, when I was in college in NYC, I had taken the Chinatown bus home for the weekend, got into Boston late At night and took the train to Quincy to stay until my mom, a cardiac care nurse, got out of work from her overnight shift to pick me up in the morning, I was laying on the couch tossing and Turning, wired from my travels when in shuffles Gon-Gon, doing a night check of sorts, checking locks, arranging furniture…I hear him go into the kitchen so, since I’m wide awake at this point, I follow him in there, he was making hot water with his impeccably detailed mr. coffee maker and he offered me some hot water in a mug, we sat at the table sipping the hot water, with a little chit chat about school and my travels but mostly quiet silence and I found in him that night, a kindred spirit, who I know I inherited my tendency towards insomnia from…see, usually when I was with him, it was around our entire huge family and I had to share him, but I got to spend some sacred moments that night just Gon-Gon and I sipping hot water from mugs. My grandfather had done farming in the old country and always had a knack for making plants grow…When I was little, He had a garden at 12 Milford street in the south end Boston, where he grew a great number of vegetables, pulling out Winter melon and bitter melon, larger than me (I was probably around the age of my 4 year old daughter now) In those summers when I would stay over, He taught me about mixing coffee grinds to improve the soil of certain plants, like roses. Ever the modest person, when we would compliment him on his prolific garden he would say, “look, I killed them” when in fact he had masterfully grown a bountiful garden oasis. My grandfather was always in motion. He traveled across the world to make a better life for his family, and when they settled in Boston, he worked as hard a he could to create a place where they could live, grow and prosper. As long as he was active, he traveled, eating food wherever he went, he knew the best Chinese restaurants (and personally knew the people who worked there). My grandfather always put others before himself & went through life with a wry sense of humor. I think we all got caught in the cross-hairs at one point or another and no one wanted to be called, “Numbsy Gumbsy”. In every aspect of his life he was a true family man, always providing, always thinking ahead and on to the next thing. He survived being orphaned as a child. By creating a family, giving, growing and nurturing them, I feel that he created true sense of belonging, that has permeated generations In our family and had positive ripple effects in us, He was happiest around his gathered family that’s why he always had the biggest smile on his face and a sense of ease. He taught us so many things from his memorable cooking, to his tireless, hard work ethic, to his generosity. Above all, He taught me that True wealth is the people we love and cherish and they are our legacy. There are many more pictures on the website for Waterman Funeral Home, here.